Although Goya is now best known for his innovative and incisive depictions of such themes as the excitement of the bullring and horrors of the Napoleonic wars, it was as a portraitist that he first gained fame among his countrymen. In 1783, Goya was called to Arenas de San Pedro by the Infante Don Luis, brother of Charles III, to paint a family portrait. He also painted individual portraits of family members such as this one. Ingenuous but self-assured, the future countess wears the fashionable attire of a lady of the Spanish court as she poses at the edge of a terrace. She gazes out at the viewer with an innocence very much in contrast with her adult costume and mature stance. 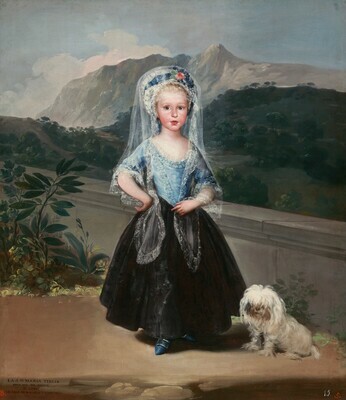 In the style of earlier "grand-manner" portraiture, Goya may have manipulated the setting to enhance the image of the diminutive sitter, perhaps adjusting the scale of the parapet to her size and placing the wall close to her. This is one of four portraits by Goya of María Teresa, with whom he maintained a lifelong sympathetic relationship. One of the most tragic figures at the court of Charles IV, the countess was trapped in a humiliating marriage to the King's minister, Manuel Godoy, arranged by the Queen, Maria Luisa, for her own duplicitous purposes. Commissioned by the Infante Don Luis de Borbón [1727-1785], Palace of Arenas de San Pedro, near Avila; by inheritance to his daughter, the sitter [1779-1828], Palace at Boadilla del Monte, near Madrid; by inheritance to her only child, Carlota Luisa de Godoy y Borbón [1800-1886], Condesa de Chinchón, Duquesa de Alcudia y de Sueca, Boadilla del Monte, in whose possession it was recorded in 1867 and 1886; by inheritance to her son, Adolfo Ruspoli [1822-1914], Duque de Sueca, Conde de Chinchón; possibly bought in or purchased by the family at his (liquidation sale, Paris, 7 February 1914); his daughter, Maria Teresa Ruspoli y Alvarez de Toledo, wife of Henri-Melchior Cognet Chappuis, Comte de Maubou de la Roue, Paris;; her nephew, Don Camilo Carlos Adolfo Ruspoli y Caro [1904-1975], Conde de Chinchón, Duque de Alcudia y de Sueca, Madrid, by 1951. Sold by the family by March 1957 to (Wildenstein & Co., New York); purchased 2 March 1959 by Ailsa Mellon Bruce, New York; gift to NGA 1970. Pierre Gassier, "Les portraits peints par Goya pour l'Infant Don Luis de Borbón à Arenas de San Pedro", Revue de l'Art 43 (1979): 21, note 24. Charles Yriarte, Goya: sa biographie et le catalogue de l'oeuvre (Paris, 1867): 138; El Conde de la Viñaza, Goya: su tiempo, su vida, sus obras (Madrid, 1887): 225, no. 29. See also Gassier 1979, 21, note 26. Biographical information on the Condesa and her descendants is given by Almanach de Gotha (Leipzig, 1939): 614-615; Juan Moreno de Guerra y Alonso, Guía de la grandeza (Madrid, 1917): 52; World Nobility and Peerage, vol. 87 (London, 1955): 158, 171; Domingo Araujo Affonso, Robert Cuny, Alberto de Mestas, Simon Konarski, and Hervé Pincteau, Le sang de Louis XIV, 2 vols. (Braga, 1961), 1:192; 2:492-497. Recorded in his possession by Richard Oertel, Francisco de Goya (Leipzig, 1907): 54 and Albert F. Calvert, Goya: An Account of his Life and Peace (London, 1908): 60. Also noted in 29 November 1988 letter from Ay-Whang Hsia of Wildenstein & Co., New York, NGA curatorial files. According to Cleveland Museum of Art records (European Paintings of the 16th, 17th, and 18th Centuries; Cleveland, 1982; p. 486) for Goya's Portrait of the Infante Don Luis de Borbón, which has the same provenance as the NGA portrait, Adolfo Ruspoli died in Paris on 4 February 1914, after which his estate was liquidated on 7 February 1914. Xavier Desparmet Fitz-Gerald, L'oeuvre peint de Goya ,4 vols. (Paris, 1928-1950):2:13, no. 292 claims that this painting was in the liquidation sale. Perhaps it was bought in or purchased by the family at this time. 29 November 1988 letter from Wildenstein's. Purchase date from Wildenstein's is noted in the Ailsa Mellon Bruce notebook, NGA curatorial files. Goya: The Condesa de Chinchon and Other Paintings, Drawings, and Prints from Spanish and American Private Collections and the National Gallery of Art, National Gallery of Art, Washington, D.C., 1986-1987, unpaginated brochure. Goya: La imagen de la mujer [Goya: Images of Women], Museo Nacional del Prado, Madrid; National Gallery of Art, Washington, D.C., 2001-2002, no. 30 (Spanish cat. ), no. 21 (English cat. ), color repro. Goya e la tradizione italiana, Fondazione Magnani-Rocca, Parma, 2006, no. 27, repro. Goya: Order & Disorder, Museum of Fine Arts, Boston, 2014-2015, no. 48, repro. The painting is on a coarse, open-weave fabric attached to a lining fabric of heavy plain weave. The thin red ground does not conceal the fabric texture. Goya applied paste-consistency oils directly with a great deal of certainty. Because the dog is the only compositional element that overlaps adjacent areas, it seems possible that Goya had not planned to include the dog when he began the portrait. There is very little evidence of glazing. The painting is in fairly good condition with slight losses and abrasion. There is retouching in the sky at upper left, at the bottom of María Teresa's skirt (between her right shoe and the dog), and in the foliage at bottom left. The red ground may be more prominent in the sky now than at the time of the portrait's completion due to a combination of minor abrasion and increased transparency of the blue-white mix. Yriarte, Charles. Goya, sa biographie et le catalogue de l'oeuvre. Paris, 1867: 138. Lefort, Paul. "Francisco Goya y Lucientes." In Charles Blanc et al. Histoire des peintres de toutes les écoles: Ecole espagnole. Paris, 1869: 6, 12. Viñaza, Conde de la (Cipriano Muñoz Manzano). Goya: su tiempo, su vida, sus obras. Madrid, 1887: 225, no. 29. Lafond, Paul. "Goya." Revue de l'Art Ancien et Moderne 7 (1900): 46. Benusan, Samuel Levy. "Goya: His Times and Portraits." The Connoisseur 2 (1902): 31; 4 (1902): 122. Oertel, Richard. Francisco de Goya. Leipzig, 1907: 54-55. Calvert, Albert F. Goya: An Account of His Life and Works. London, 1908: 124, no. 60. Sentenach, Narciso. Los grandes retratistas en España. Madrid, 1914: 112-113. Beruete y Moret, Aureliano de. Goya, pintor de retratos. Madrid, 1915: 22-23, 171, no. 64. (also English ed. translated by Selwyn Brinton. London, 1922: 26-28, 205, no. 66.). Loga, Valerian von. Francisco de Goya. Berlin, 1921: 42, 188, no. 153. Mayer, August L. Francisco de Goya. Munich, 1923: 12-13, 186, no. 184. Translated by Robert West [pseud.]. London, 1924. Desparmet Fitz-Gerald, Xavier. L'oeuvre peint de Goya. 4 vols. Paris, 1928-1950: 1:15; 2:13, no. 292. Derwent, Lord George Harcourt Johnstone. Goya: An Impression of Spain. London, 1930: 32. Sánchez Cantón, Francisco Javier. Vida y obras de Goya. Madrid, 1951: 28, 167. Translated by Paul Burns. Madrid, 1964. Trapier, Elizabeth de Gué. Goya and His Sitters. New York, 1964: 2-3, 52, no. 1, figs. 1-2. Held, Jutta. "Literaturbericht: Francisco de Goya: die Gemälde." Zeitschrift für Kunstgeschichte 28 (1965): 235-236. Lurie, Ann Tzeutschler. "Francisco Jos de Goya y Lucientes: Portrait of the Infante Don Luis de Borbón." Bulletin of the Cleveland Museum of Art 54 (1967): 5, fig. 7. Gassier, Pierre, and Juliet Wilson. Vie et oeuvre de Francisco Goya. Paris, 1970. Translated by C. Hauch and J. Wilson. New York, 1971: 17-18, 61, 78, 94, no. 210, color repro. 59 (also 1981 ed. : same pp. as above.). Gudiol y Ricart, José. Goya: 1746-1828; Biography, Analytical Study and Catalogue of His Paintings. Translated by Kenneth Lyons. 4 vols. New York, 1971: 1:52, 243, no. 150; 2:figs. 244, 246, color fig. 245.
de Angelis, Rita. L'opera pittorica completa di Goya. Milan, 1974: 98, no. 158, repro. Walker, John. Self-Portrait with Donors. Boston, 1974: 198-200, repro. 199. European Paintings: An Illustrated Summary Catalogue. National Gallery of Art, Washington, 1975: 160, repro., as Condesa de Chinchón. Wethey, Harold. "El Greco's' St. John the Evangelist with St. Francis' at the Uffizi." Pantheon 35 (1977): 205. King, Marian. Adventures in Art: National Gallery of Art, Washington, D.C. New York, 1978: 76, pl. 45. Gassier, Pierre. "Les portraits peints par Goya pour l'Infant Don Luis de Borbón à Arenas de San Pedro." La Revue de l'Art 43 (1979): 13, 18, fig. 2. Salas, Xavier de. Goya. Translated by G. T. Culverwell. London, 1979: 50, 177, no. 145, color repros. 33-35. Glendinning, Nigel. "Goya's Patrons." Apollo 114 (1981): 238. Gassier, Pierre. "Goya, pintor del Infante D. Luis de Borbón." In Goya en las collecciones madrileñas. Exh. cat. Prado, Madrid, 1983: 18. Agueda, Mercedes, and Xavier de Salas, eds. Francisco de Goya: cartas a Martín Zapater. Madrid, 1984: 107-108, no. 49; 109, n. 7; 121, n. 13. Camón Aznar, José. Francisco de Goya. 4 vols. Saragossa, 1: 150-151, repro. 274. Walker, John. National Gallery of Art, Washington. Rev. ed. New York, 1984: 401, no. 568, color repro., as Condesa de Chinchón. European Paintings: An Illustrated Catalogue. National Gallery of Art, Washington, 1985: 184, repro. Arnaiz, José Manuel, and Angela Montero. "Goya y el Infante Don Luis." Anticuario 27 (1986): 44-45, repros. 48, 49. Gassier, Pierre. "La contessa di Chinchón." Goya nelle collezioni private di Spagna. Exh. cat. Collezione Thyssen-Bornemisza, Lugano, 1986: 18-19, repro. 19. Symmons, Sarah. Goya: In Pursuit of Patronage. London, 1988: 98, repro. 99. Brown, Jonathan, and Richard G. Mann. Spanish Paintings of the Fifteenth through Nineteenth Centuries. The Collections of the National Gallery of Art Systematic Catalogue. Washington, D.C., 1990: 27-32, color repro. 28. Gingold, Diane J., and Elizabeth A.C. Weil. The Corporate Patron. New York, 1991: 151, color repro. Kopper, Philip. America's National Gallery of Art: A Gift to the Nation. New York, 1991: 263. National Gallery of Art, Washington. National Gallery of Art, Washington, 1992: 89, repro. Goya: Images of Women. Exh. cat. Museo Nacional del Prado, Madrid; National Gallery of Art, Washington, 2001-2002: no. 21. Hughes, Robert. Goya. New York, 2003: 113-114, color repro.